Show your best with this professional, book like finish. Documents bound with Black Velobind Hot Knife Binding Strips are great for filing, stacking and mailing. With Velobind's patented Hot Knife binding technology, these black spines permanently lock pages into place to keep reports and proposals secure. These Black Velobind Binding Strips include 11 equally spaced pins (for 11" books) and are designed for use with GBC's line of Hot Knife Velobind Systems including the GBC V800pro Velobind System One, GBC Velobind System Two, GBC Velobind System Three Pro, GBC Velobind System Four "Bind" and the SecureBind V2000-Pro Binding Machine . Size: 8.5" x 1" - 14" x 1"
Perfect order, timely arrival, could not have been happier all around! This product works very well with our velo binding machine. arrives so quickly and was so easy to order. Company representative for mybinding.com was so helpful, even gave details for purchase order setup to make it easier to use their customer appreciation coupon. We prefer the genuine GBC strips for our books. We have been buying them for years and they always work and the pins always cut off. MyBinding carries all of these in stock which is awesome. 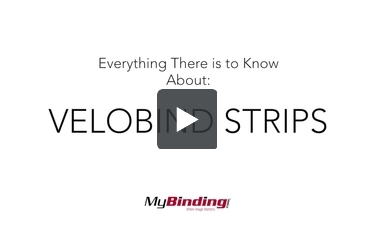 Velobind Strips Review by Judith J. Binding books are made easier by using Velobind Strips. They hold up to heavy use and are easy to use. Ordering was easy, Price was Review by Stephen H.
Ordering was easy, Price was great, Fast shipping. Thanks! Easy to Order, Fast Shipping! Review by Stephen H.
Easy to Order, Fast Shipping! I would like to order the velobinding strips GBC black 11 X 1. Tell me how? Thank you for your question. We accept orders primarily through our website and by phone with our customer service department. To order through the website add the item to your cart and proceed to checkout once you are done shopping. Our customer service department is available Monday through Friday from 6am to 5pm (PST) to take your order by phone at 1-800-944-4573. Where in Colorado is a binding company that can do the Velobind strip binding, I have a book that is coming apart with the Velobind strips and need to have it redone. We do not have a relationship with any specific binding company in general, we just sell the machines and supplies to do binding. I would recommend searching for a local bindery in the yellow pages some copy shops also can provide binding services.